I might be the least sentimental person on the planet because I throw away all cards unless they’re really cool-looking. My good friend Sam gave me this awesome card for Christmas a couple of weeks ago which I’ve now got up in my room to remind me of home. Sam is an engineer and one of the most creative people I know, and a gift from him is always accompanied by a card made of pretty paper that’s been folded into some beautiful configuration, impossible to reproduce unless you have a background in origami or industrial design, preferably both (needless to say, his cards never went in the trash). This year’s card was a departure from the past but lovely nonetheless, and I wasn’t surprised to hear that it’s actually from a line designed by his cousin, Nooshin Navidi of MUSE Cards. Some things just run in families, as Nooshin has a pretty diverse art background (silversmithing and gilding among graphic design and illustration, for example) and her cards are really professional. The graphic above is actually just part of my card, which came on nice, heavy black stock and opened up like a reporter’s notebook (as opposed to left-to-right, like a regular card). 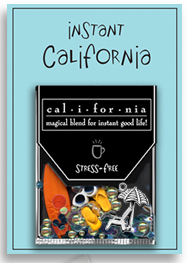 It’s called the “Instant California” card from the “Instant Infusions” line, which, as you can see, is a “teabag” filled with trinkets. I’m pretty fond of the whole travel line of the “Infusions”. I think it’d be really funny if MUSE did an “Instant Infusion” for Tehran – my choice of trinkets in that one would be tiny versions of a samovar, a book of Hafez, a Persian rug, and a backgammon board. Too bad there’s no good physical representation for taarof, because I can’t think of anything more Iranian than that (and granted, both tea and samovars are Russian inventions but Persians are massive tea snobs). The short of it is these cards are pretty charming, and mine’s making me miss the beach and sunshine. MUSE doesn’t have e-commerce on the site yet, but you can buy the cards from the MUSE catalog. I know Nooshin personally, she’s really cool and talented! She’s always making new designs and now Muse Cards has an online store!!! I have no doubt that there will be an “Instant Infusion” for Tehran in the future. She got tons of great ideas of her creative sleeve! Her latest line, “musings”, are super cute too!